When Jenny reached out to me to share her fabulous resource to help mom’s, I couldn’t resist. While I have several tips for moms and have worked with kids on many occasions, the value from actual moms living and breathing just may create that extra bit of buy-in for those in doubt of play and fitness’ importance. For that reason, I hope this resource helps those of you who need that little extra push that you CAN do it and MUST have your kids do it as soon as possible. There is such transference of behaviours and habits that occur from the benefits of play, exercise, movement, a fitness lifestyle the earlier you start. The good habits developed help to make it a part of their lives into their senior years helping to prevent illness and disease. The skills learned help to create a more well-rounded level of intellect that will help in their schooling, in their careers and in surviving in the world with all of its chaos. 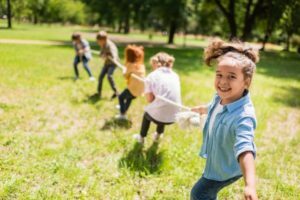 Aside from the physical and cognitive benefits that will come, there is a development of much-needed social skills, empathy, teamwork and collaboration abilities, again, all essential tools for being a well-developed individual. I cannot emphasize enough to everyone that play, fitness and the lifestyle it entails truly is the most important thing in the world. If you are a parent or someone who works with kids, please check out the resource by clicking on the image below for some ideas on what you can do.